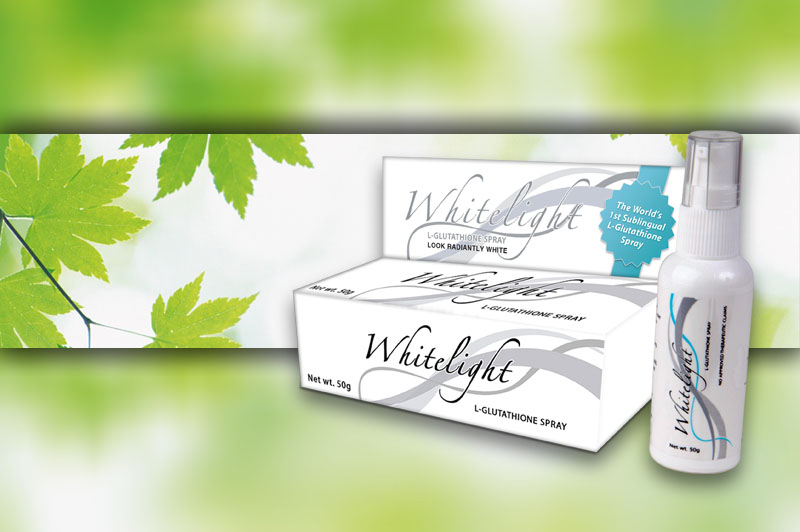 Whitelight Glutathione Sublingual Spray is the world’s first glutathione sublingual spray! Sublingual literally means under the tongue and refers to a method of administering substances orally in such a way that the substances are RAPIDLY and MORE EFFECTIVELY ABSORBED as compared to capsules or tablets via the digestive tract. There is no danger of overdose since glutathione is a natural compound found in the body. Whitelight Glutathione Sublingual Spray’s Glutathione as an antioxidant, helps liver to remove toxins from our body, promotes longevity, prevents cataracts and heart disease, is beneficial to a variety of conditions such as asthma (skin or lung), cancer, oesteoarthritis, Parkinson’s Disease, immune suppresion resulting from AIDS, hearing loss, male infertility and don’t forget the skin lightening side effect. There has been no known untoward side effects from taking Glutathione supplements. Many are enjoying this side effect benefit of lightening of the skin, as it is the safest alternative compared to harsh ingredients from skin whitening products such as Hydroquinone, mercury and such which is hazardous and toxic to our body. With Whitelight Glutathione Sublingual Spray, you can achieve this; healthy system, looking and feeling young and fairer skin rolled into one. “Glutathione is a very small molecule produced by the body and found in all types of cell and it is the body’s most important antioxidant because it is within the cell.” – According to Gustavo Bounous, MD, director of research and development at Immunotec and retired professor of surgery at McGill University in Montreal, Canada. Because glutathione exists within the cell, it is in the prime position to neutralize free radicals which can build up in cells and cause damage. It helps keep cells running smoothly. Glutathione is extremely important for maintaining intracellular health. Glutathione is a tripeptide (consisting of 3 amino acids joined by peptide bonds). It is a tripeptide composed of the amino acids glutamic acid, cysteine and glycine. It has shown positive preliminary results in several studies of glutathione’s ability to affect levels of reactive oxygen species, which may have implications in the reduction of cancer rates. Dietary glutathione is found in fres and frozen fruits and vegetables, fish and meat. Asparagus, avocado and walnuts are particularly rich dietary sources of glutathione. Antioxidants protect cells from reactive oxygen species such as free radicals and peroxides. Metabolically, glutathione plays a substantial role in the functioning of the body’s immune system. Its antioxidant property makes it vital to white blood cells (lymphocytes) as it allows them to reach their full potential during oxygen-requiring activity of the body’s immune response. Glutathione is found in two forms, a monomer that is a single molecule of the protein, and a dimmer that is two of the single molecules joined together. The monomer is sometimes called reduced glutathione, while the dimmer is also called oxidized glutathione. The monomer is the active form of glutathione. Oxidized is broken down to the single molecule by an enzyme called glutathione reductase. “under the tongue” refers to a method of administering substances orally in such a way that the substance are rapidly and more effectively absorbed compared to capsules and tablets via the digestive tract. Sublingual routes of administration have certain advantages over simple oral administration. This route is faster, and entering a drug into one’s body under the tongue or sublingually ensures that the substance will only come in contact with the enzymes in saliva prior to entry into the bloodstream. Highly Recommended! First in the Philippines! Generally considered to be free of side-effects. No untoward side-effects nor interactions with oral administration reported even in prolonged use. It is SAFE. Classified as Food Supplement not a herbal. The only reported side- effect is SKIN WHITENING when taken in increased doses.